Have you seen my face on an ad for a mobile app? 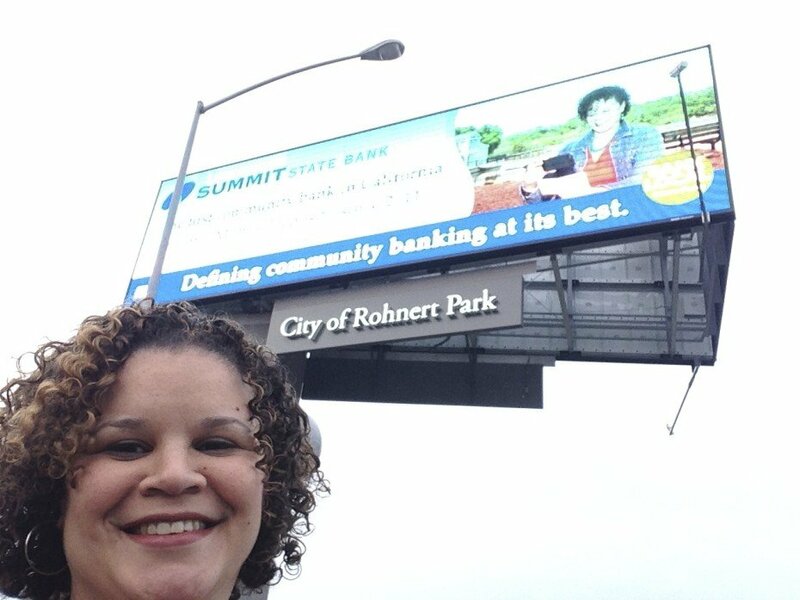 One of my dear friends, Elaina Hunt, is the Director of Marketing for Summit State Bank. I was working with their staff back in 2011 when it occurred to Elaina that I would be good for a customer testimonial campaign featuring their brand new top secret mobile application. They were the first Sonoma County local bank that offered the deposit feature and it was really exciting for them to be first in the space. I am a customer and because my specialty is technology, they thought I was the perfect fit. They asked if I’d be interested in being one of the faces of their campaign and I was quick to say yes. The original campaign included me in: their mobile website page, all their collateral, huge signs in their bank branches, signs on their ATMs, on local radio stations, in newspaper and magazine ads, and on a billboard in south Santa Rosa. The day before the billboard went up, I freaked out. How often does that happen? I called my sister who works in marketing and told her that I felt like an explosion of emotion was going off inside me. I was excited for the exposure yet scared to be so visible both at the same time. No, no I didn’t. What I did get is my name, business name, and face in every form of media with high placement for prolonged periods. It’s advertising that I simply don’t have the budget for and a level of exposure I never wouldn’t gotten otherwise at that point in my career. 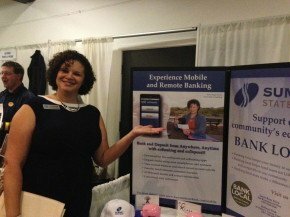 Let me tell you, I am GRATEFUL to SSB President/CEO Tom Duryea and Elaina for making me Summit State Bank mobile app poster girl. I felt really uncomfortable with it at first because people I didn’t know (or know that well) would come up to me and say, “I saw you on a billboard/ATM!” For the life of me, I couldn’t think of a snappy response. I ended up saying, “Yup!” I created my own game and hashtag #whereskerry. I was clearly the only one using it but it made the experience less weird. 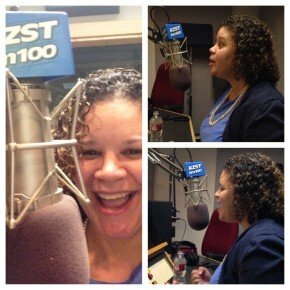 Then in 2014, Summit brought the campaign back around, recycled the same image, created mailer inserts, put me up on a rotating digital billboard in Rohnert Park, and had me record a new radio commercial. With many more years of speaking and media work under my belt, I simply nailed that commercial. I’m proud of it and think it sounds really good. My whole life people have been telling me I look familiar to them. After my sister told me that she often got the exact same comment, I began responding with, “I’m a familiar looking person.” and that worked really well. Now, when someone says that to me, I feel awkward listing all the ways they may have seen my face. 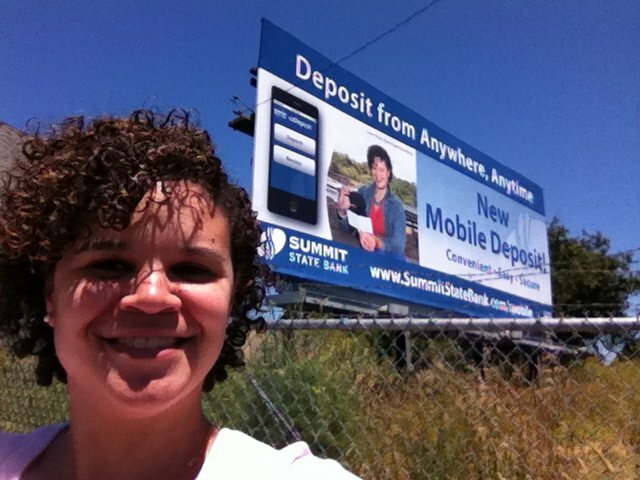 I know, #firstworldproblems, but that’s the story of me being the face of Summit State Bank’s EZDeposit Mobile App. 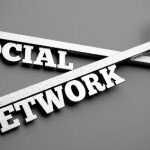 Get Those Social Media Keys Back!